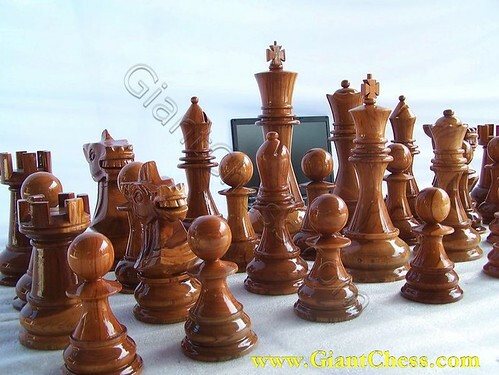 GiantChess.com always provide handmade product with high quality and beautiful carved. The products have carved by expert craftsman and polished in elegant looks. Those are polished in brown color with glossy touch. Beside as chess pieces in chess game, those are also perfect for house decoration. You can use it for indoor and outdoor need, because we have prepare them for its durability in outdoor area. Those carved chess pieces in the picture above have designed in giant size and carved in chess pieces shapes. Very durable in any seasons, because those pieces are made of best quality of Teak wood as the strongest wood in the world. We choose the best Teak wood as our main material in order to avoid damaged of termites and another wood damage. Based on this, you can left it outdoor for months.